During our two night stay at Halape, we swam in coves along the shore and explored brackish pools along the coast before backpacking out at first light on the third and final day. 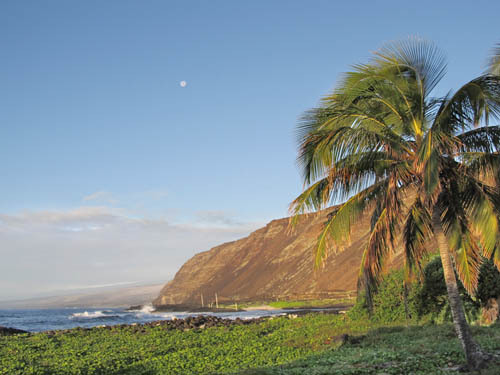 The view from our campsite on the Kaʻu Coast of Hawaiʻi Volcanoes National Park was spectacular at sunrise — we could see the moon shining brightly over the 1,500 foot cliffs of Mauna Kapukapu and the beaches and coves at Halape. 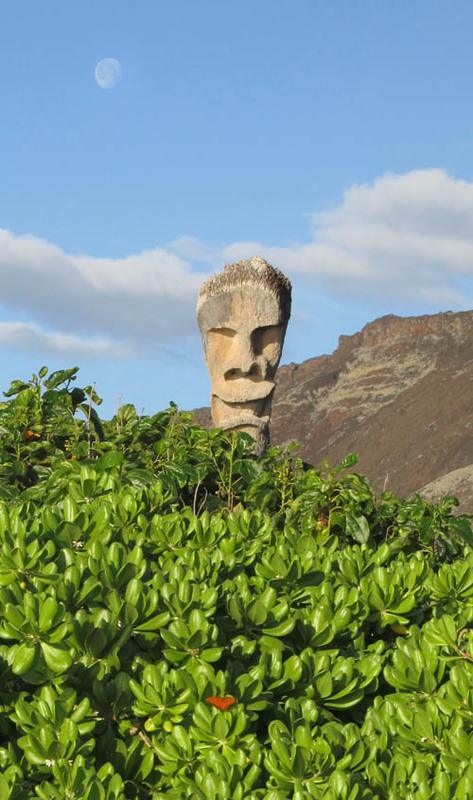 The earthquake and tsunami of 1974 caused a part of the land along the shore to subside into the ocean and when the submerged coconut trees died and washed ashore, their logs were skillfully carved into tiki and erected all along the coast. 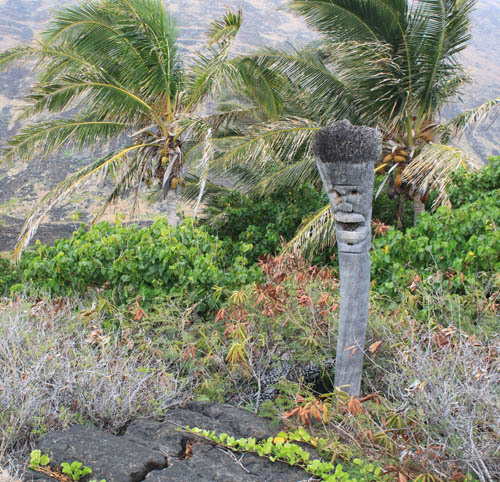 Our campsite was shaded under coconut (Cocos nucifera) and milo (Thespesia populnea) trees and were guarded on the back side by this tiki. 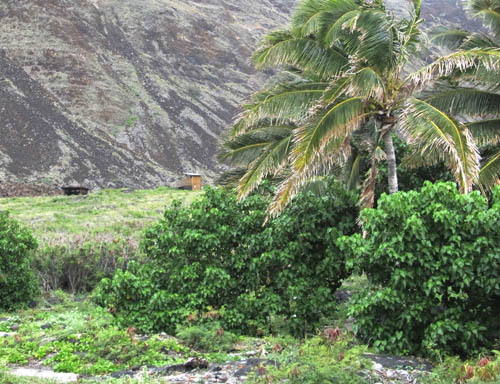 Many coconuts hang from the trees at Halape — another emergency water source in time of drought — but it is not easy to get to the coconut milk inside. 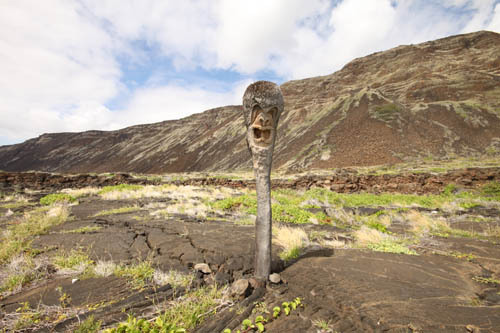 Each tiki is unique and gives a special Hawaiian sense of place to Halape. This one stands as a lone sentinel over a crack in the earth were a brackish pool is located. When I saw this gulf fritillary butterfly, tiki, and moon, I went into a patch of beach naupaka (Scaevola sericea) to get this shot. We ventured further down the coast to explore Halape Iki which has a beautiful cove to snorkel and swim in. It was awesome to dive in the water and see all the coral, fishes and invertebrates. We saw half-beak stickfish, papio, uhu, manini, kikakapu, weke, and a host of other creatures in the cove. 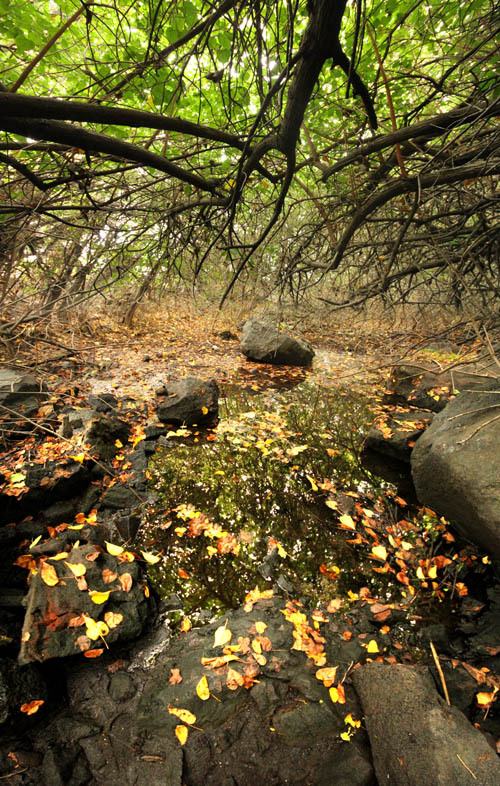 We explored a shallow brackish pond where a grove of milo trees had established themselves. When it rains on the slopes of Kīlauea, water seeps into the porous lava and travels underground by the force of gravity to the coastal lowlands. Since fresh water is less dense than salt water, fresh water floats on top salt water and is forced to the surface when the ground water reaches the coastline. The water in this pond is brackish — mostly fresh but with some salt water whose level rises and falls with the tides. 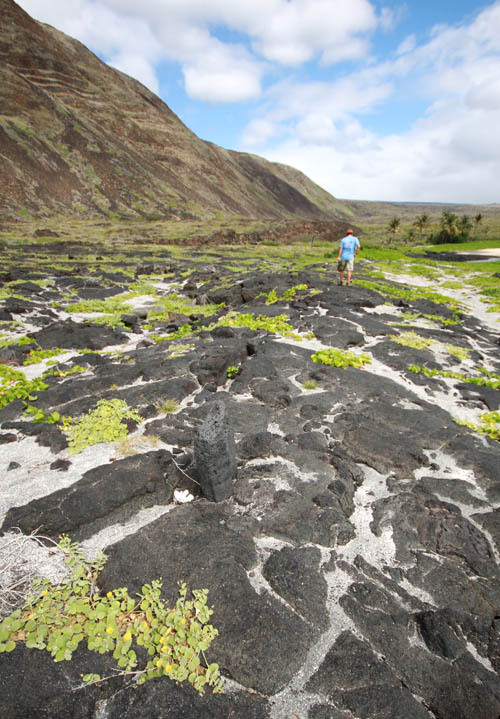 Since we wanted to swim in a much deeper brackish pool we hiked over smooth pahoehoe with patches ʻilima papa (Sida fallax) growing prostate on the ground with bright yellow flowers to a fracture in the earth where the pool is located. 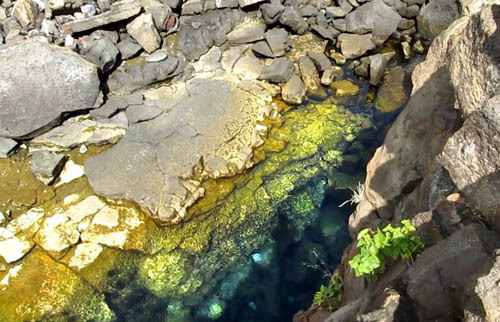 The brackish pool is located behind the shelter at Halape at the bottom of a crack along a fault line at the base of Mauna Kapukapu. 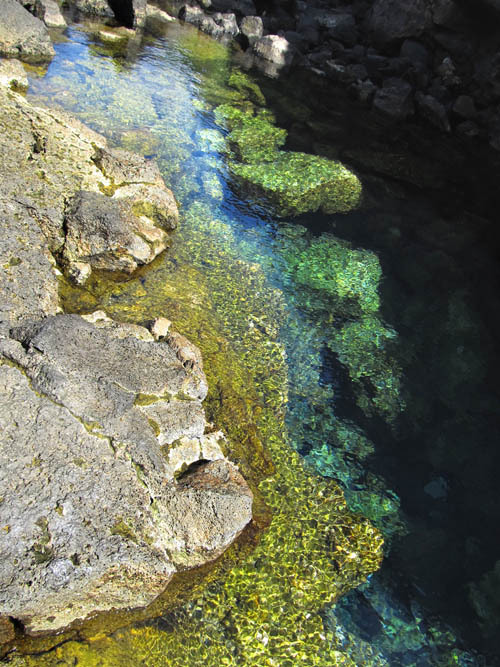 The crack narrows and deepens in the center and gives its incredibly clear waters an amazing blue-green color. We swam in the pool and relaxed in a grove of kou trees (Cordia subcordata) with orange flowers that shaded us from the noon-day sun. Dragonflies skimmed the surface of the pool and a number of butterflies, moths, and other insects came to the water’s edge. The pool is about 40 feet long and 12 feet at its widest. The margins of the pool are no more than 3 feet deep but in a small area in the center where the crack is deepest the water is 8 feet deep. The water tasted just a little salty and was slightly warm. 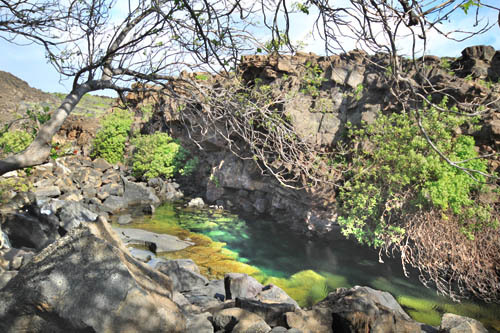 It felt good to swim in the brackish water and to see small translucent shrimps — ʻopae — along rocky overhangs in the pool. Soon it was time to do our one chore for the day — replenish our drinking water. So we made our way to the water tank at the shelter to filter and refill our bottles. We then returned to our campsite in the coconut and milo trees to prepare our final dinner and spend our last night at Halape. 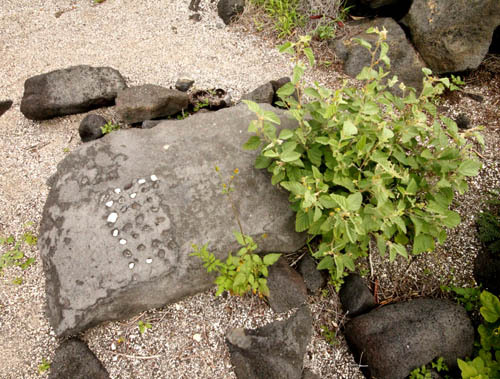 One of the more interesting artifacts we stumbled upon on our way back to camp was a konane board — where the Hawaiians played a form of checkers. Heating water for Thai noodle soup and tea, I used an esbit stove to bring the water in my titanium pot to a boil. I also ate crackers, string cheese, oranges, almonds, and raisins. After relaxing under the stars we decided to turn-in early. Our plan was to break camp before sunrise to push off at first light, and we wanted to sleep as long as we could before our return trek first thing the next morning. So we crawled into our tents and went to sleep. 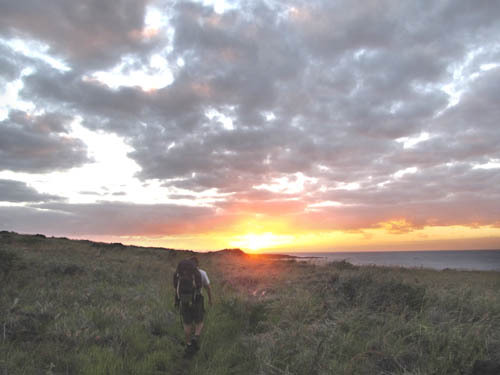 Early the next morning we awoke about an hour before before dawn, broke down camp, packed our gear, and pushed-off for Keauhou just as the sun rose above the horizon. 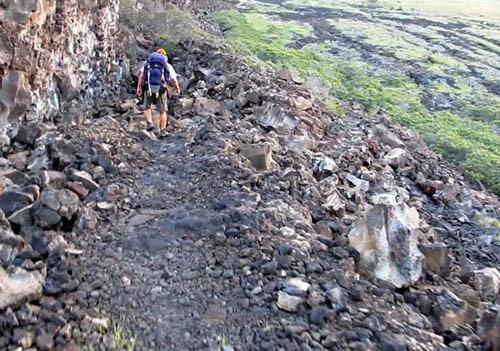 The return leg of our backpacking trip would take us 8-1/2 miles up the slopes of Kīlauea back to 2,860 feet elevation. The air was cold so I was happy to be moving and hiking on an ever so graduall incline to generate body heat. This gigantic rock field must have been brought here by earthquakes that rock the area due to volcanic activity. 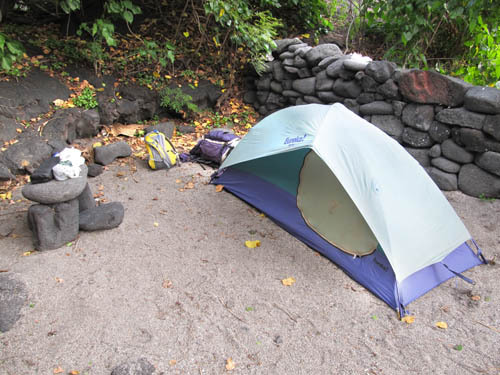 We descended the jumble of rocks with the path of fitted stones and made our way to fields of haole koa and lilikoi. The uphill grade was so slight up the Kīlauea escarpment, it did not feel like we gained a whole lot of elevation but we gained 2,860 feet of elevation over 8-1/2 miles. We passed many bright blue morning glories as we made our way up the grasslands. 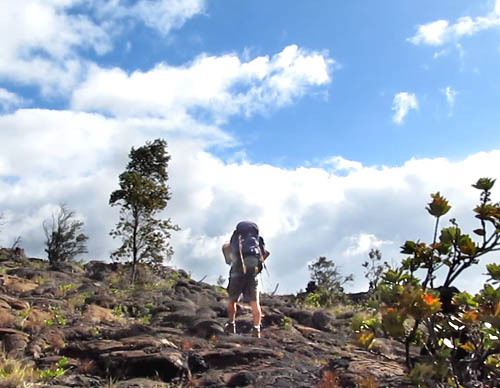 Soon we reached the parched lava fields dominated by small ʻōhiʻa trees. When we reached the recent lava flows from the 1969 – 1974 Mauna Ulu eruptions, I knew we were close to the Chain of Craters Road where Pete’s car was parked. 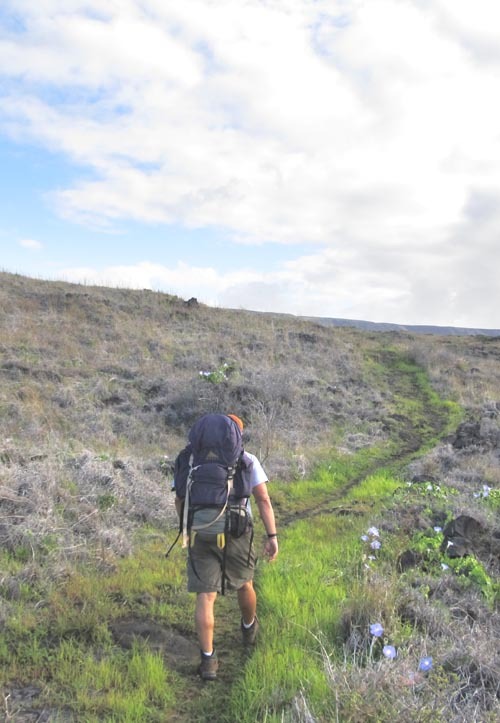 Motivated by the prospect of eating real food at Volcano Pizza, we eagerly put our packs into the trunk, took-off our shoes, and drove up the Chain of Craters Road. As we made our way to Volcano Village, I reflected on the great time we had swimming in the coves and pools at Halape and relaxing under the shade of milo and coconut trees. What an awesome place to backpack! Yep… lots of fish there! Dang! awesome pictures as usual. Good to get a feel for the place before I go there this weekend. Thanks. Wow! Found your blog/pics while searching for Halape images to share with my middle school ELA students. We are currently doing a novel study on Night of the Howling Dogs by Graham Salisbury, which is a historical fiction book based on the 1975 earthquake and tsunami that devastated this area. A Boy Scouts Troop, along with other campers, were camping at Halape when it struck. Thanks for such great images and video to help my students visualize what these people experienced that early morning! I have always wanted to go to Halape. Thanks for great pictures and commentary, as usual. I will put this on my “to do” list. Also watched the Mokuleia trip. The trail looked familiar. Did you go up from the Yokohama Bay side then over the ridge? Great pictures, Thanks. Hi my teacher is acualy getting Gram Saulsbary to come to out school and let me just say it will be a big suprise for him. I loved you book night of the howling dogs. It was one of the best i have ever read. I love the pictures you put up, i would love to go there sometime. oh and the teacher is Mrs. Ally.